← Adult Coloring…Fred Gonsowski’s drawings of the “Big Eyed People” to download, print and color. Twelve different ways of arranging furniture in a 20 foot by 20 foot square living room with a fireplace in the corner and french doors. Recently a reader asked for my help with the placement of furniture in her 20 foot square living room after reading my blog post titled “Arranging furniture around a Fireplace in the Corner of a Room“. Initially I thought the space would be easy to lay out, but because of a corner fireplace, french doors, three entrances into the room, and windows on two walls, there was not much wall-space to put furniture against. So my readers dilemma became the inspiration for this article, which is a topic that I had not yet covered here at FGGH. Before I go over the twelve different floor plans that I came up with, I want you to look at the cover illustration for this post. 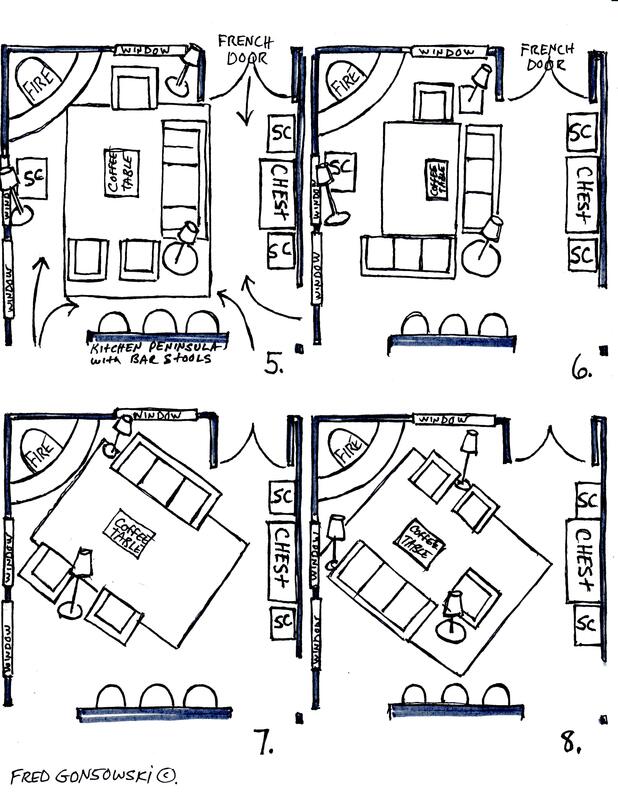 The room shown, is the room that my reader has and depicts one of the furniture arrangements that I came up with (It is the 4th floor plan) and how it could possibly be decorated. First of all look at the corner fireplace that is on the left side of the room. The fireplace, which is the focal point of the room, is made of brick and goes from floor to ceiling. Working with a large, visually strong, element like that you have to counterbalance it with some other large-scaled item(s) in the room (preferably opposite it). To read more about counterbalancing elements in a room read my post Interior Decorating is ALL about Equal Balance. Next look at the right side of the room illustration, and notice the chair with two pictures hung over it, flanking the corner of a chest. That chair is just one of two that will be part of a grouping that will be seen in most of the furniture layouts for the room. The grouping on that side of the room could be made using a single large cabinet, or the combination of a chest/credenza and art works that would be hung over it that makes a visually larger arrangement, that would counterbalance the fireplace. The next illustration shows how a large cabinet or different items hung over a chest/credenza can be grouped together to form visual weight. Furniture and decorative elements, that when grouped together suggest visual weight and vertical tension. The above illustration shows five different pieces of furniture and pictures, that when grouped together possess vertical tension (groupings of things that are taller than wide and together provide visual weight). 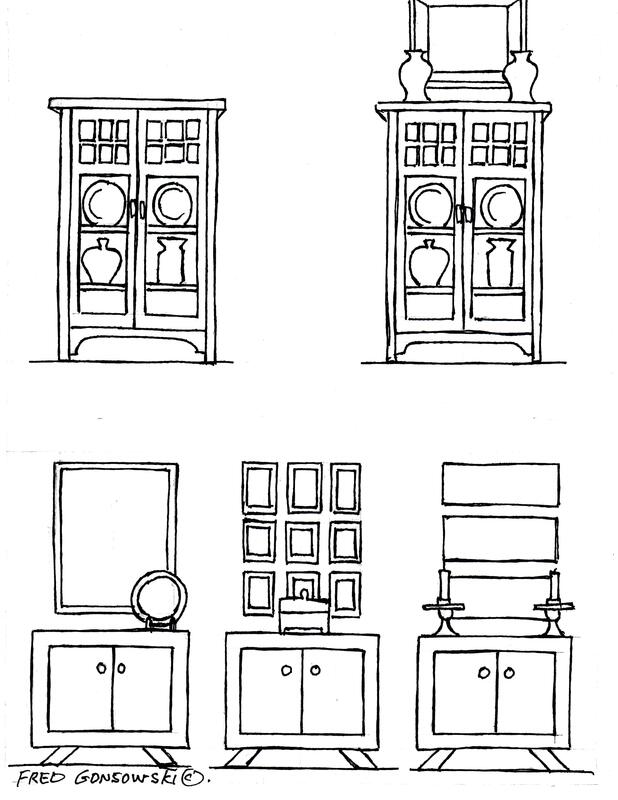 The top left illustration shows a Mission styled curio cabinet that is taller than wide. A piece of furniture like that (no matter what furniture style it is, be it modern, traditional, country, etc), because of its wood color and shape possessed a lot of visual weight. In a room with a an 8 foot high ceiling, a tall cabinet, bookcase, high-boy, china cabinet, folding screen, armoire, chest with hutch, etc. would all be about the right height of product to counter balance a fireplace, like seen in the illustration. The top right illustration shows the same Mission styled curio cabinet, but a pair of vases and a framed artwork are now above it. The addition of the extra decorative elements makes the Mission cabinet seem even more visually stronger, suggesting even more height and vertical tension. Adding the extra decorative elements to the curio would work best in a room with a 9 or 10 foot, or even higher ceiling. Not everyone has the ability to go out and buy a large-scaled item when needed. The three bottom illustrations show the same chest/credenza with different sizes of pictures hung over it, that when combined make a large-scale vertical format display. Notice how the height of the chest/credenza and the three examples of things hung over it are the same size when combined, and how the width of the three groupings of framed elements are the same. The number one problem most people have when picking out something to hang over a chest/credenza is they are picking out wall decorations that are too small. The chest on the left has just one large picture or mirror hung over it. The combined height of the chest and framed piece hung over it, make a grouping that possesses a lot of vertical tension, because together the two pieces combined are taller than wide. The center chest has 9 small pictures hung over it. Many small pieces, when combined, become one large-scale presentation. The chest on the right has three thin horizontal format pieces hung one above the other. Many horizontal format pieces, when hung one above the other become a vertical format presentation. To read more about making groupings of pictures read my posts titled Making an Interesting Arrangement of Pictures, It’s Easy to make a Grouping of Pictures and Hanging Pictures Around a Room. Now look again at the cover illustration for this post. Notice how I’ve placed a valance above the window. The reason I just used a valance was because there is no room for stack back, which keeps drapery fabric from covering the window itself. To read more about hanging curtains read The Right way to hang Curtains and Drapes. Getting back to the illustration, in the real room, the top of the windows in the room are at the same height as the top of the french door. By placing the valance higher up on the wall, so it just covers the top edge of the window frame and the top of the honeycomb shade that the homeowner has hung, it suggests that the windows are taller and makes the room seem higher. To keep the eye moving across the upper part of the room at the same level as the tops of the valances, a decorative element was also hung over the french doors to keep the eye from dropping down. If you have paid extra money for high ceilings you don’t want to cut the height with your room’s decorative elements. To read more about decorating taller rooms read my post titled It’s Easy to Decorate a Room with Tall/High Ceilings. When interior decorating a room you want to try to move color and pattern around a room from floor to ceiling, which keeps the eye moving from one place to the next and ties everything together. Looking at the cover illustration, notice how there is a plaid fabric on the chair on the left, on the valance for the window and on the skirted side chair seen on the right side of the room next to the chest. Also look at how the color orange appears on the tip of the chair on the left, the pillows on the sofa, on the two occasional chairs by the window, and is also seen in small touches in the flower arrangements on the fireplace mantel and in the two pictures hung above the side chair on the right. Finally notice how the color blue is seen on the vases, book and plate on the coffee table and as the sky color in the two pictures hung over the side chair. To learn more about working with color read Pick (Use) Four colors when Decorating a Room. The last bit of examination, of the cover illustration, is of the placement of the TV in the room. Because there is no solid wall for the TV to be put against, I feel an arm should be mounted on the wall to the right of the fireplace. By locating the TV there, the arm can be moved as needed to point the TV in the direction of the viewer(s) in the living room, and the TV can also be seen from the kitchen which is adjacent to the space. 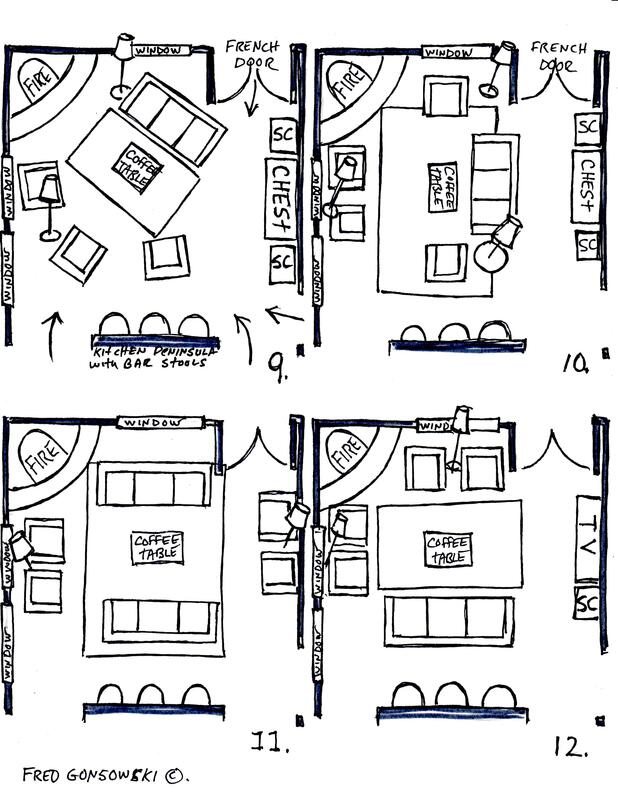 Before you look at the 12 different ways that I think the space could be arranged, I want to tell you how I came up with the placement of the furniture. First I taped together sheets of printer paper and marked off a grid, making one inch squares that represented one square foot of room space. Next I marked off 20 inches by 20 inches on the grid, which represents the size of the room, and then penciled in all of the window spaces, the fireplace, french doors and entrances to the room. After that I made paper cutouts (templates) that represented the different furniture to be used in the room. A 3 foot by 7 foot sofa became a 3 inch by 7 inch template. Chairs that in the real world measure 3 foot by 3 foot became 3 inch by 3 inch cutouts. Side chairs were made to show 25 inches by 25 inches of space, A chest/credenza/armoire which could run up to 24 inches deep by 5 foot long, became a 2 inch by 5 inch template. A cutout for a 20″ x 52/24″ bench was also made. Depending on the size of furniture bought, more space could be had between the placement of the furniture. If you are wondering why I did not use a loveseat in any of the floor plans read my post When buying Living Room furniture, FORGET the LOVESEAT, buy two Wing, Club or Occasional Chairs instead. Now let’s look at illustration 1…(click on image to expand). First of all the room is 20 foot square. The fireplace takes up 6 feet of space in both directions in the corner of the room. The three windows in the room are 58 inches wide, there is a french door that is 6 feet wide and there are three entrances into the living room (coming from the kitchen, front hall and bedrooms). A kitchen breakfast bar with three bar stools is seen in the illustration. The arrows on the illustration show how a person could enter the space. Now look at the right side of the room, on the long wall that goes from the front hall to the french doors. That is the only solid wall in the space, so that is where a large piece of furniture (tall cabinet, book-case high-boy, etc) or a combination of elements (chest/credenza and picture(s)/mirror hung over it) must be placed to counterbalance the brick fireplace. In the illustration you see two side chairs (SC) flanking a chest. Whatever you use for the center counterbalancing element, the side chairs should be flanking the center element. The side chairs, which are arm less dining room chairs. create balance on that side of the room, fill in space, and when needed can be moved to other parts of the living room for extra seating. In illustration #1 the sofa is floating in the center of the room, facing the fireplace hearth. Two club chairs have been placed by the window on the left with a floor lamp between them for room illumination. To read more about decorating with floor lamps read The answer to..”Can you put a Floor Lamp next to a Sofa?”. On the right side of the sofa another upholstered chair has been added for intimate conversation, there is also an end table with lamp by the sofa. To read more about combining end tables and lamps read The right height of Table Lamp for your End Table. At the top of the room, by the window, an upholstered bench has been added for extra seating. Like dining room side chairs with exposed legs and no arms, an upholstered bench with exposed legs provides extra seating, but looks visually less bulky in the space. Illustration 2 shows the sofa floating out from the windows on the left side of the room. A drop-leaf round table was placed behind the sofa to fill in the space. There is a lamp on that table for illumination and a floor lamp to its left. Three upholstered chairs face the sofa, floating out in the room which counterbalance it. Not seen in the illustration, another floor lamp could be placed to the left of the french doors by the window for extra room illumination. 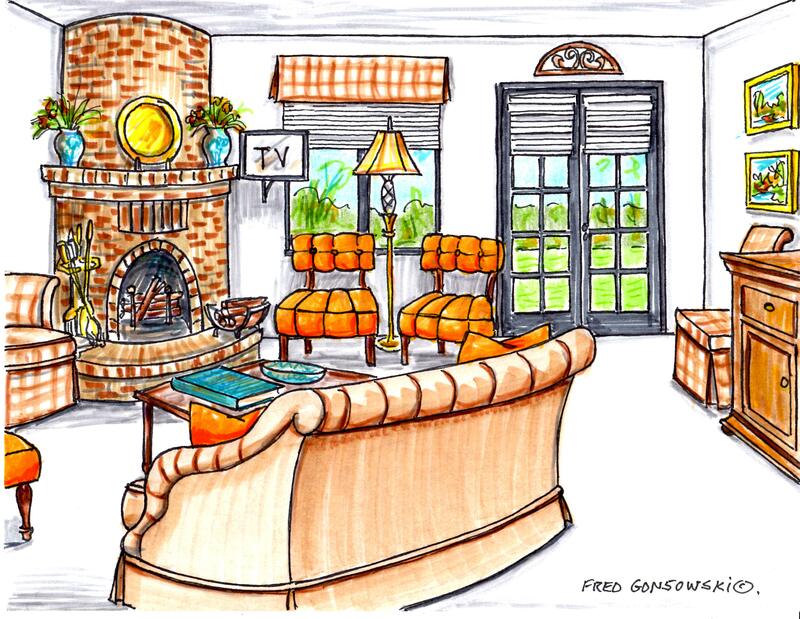 As with the first illustration and most of the upcoming illustrations, the chest and side chairs grouping on the right counterbalance the fireplace. Illustration 3 shows the sofa’s back to the breakfast bar. Two chairs are floating in the center of the room by the window and another chair has been placed to the left, by the windows, for extra seating. A floor lamp could be placed next to the chair on the left, and another floor lamp or small end table with lamp could be placed between the two chairs by the french doors. Illustration 4 shows the sofa again facing the fireplace hearth. Two pairs of upholstered chairs have been placed on both sides of the room, by the windows, with floor lamps between them to make a conversation grouping. This is the layout for the cover illustration for this post. Illustration 5 shows a three cushion sofa facing in the direction of the left side of the room. The placement of the sofa’s back naturally makes a walkway from the front hall and bedroom entrances, in the room, to the french doors. Chairs have been grouped, on both sides of the sofa for conversation. There is a side chair on the left side of the room that matches the two side chairs seen on the right side of the room. That side chair’s fabric matches the other side chairs’ fabric, which moves the fabric from one side of the room to the other. Two floor lamps and an end table and lamp (next to the sofa) provide room illumination. Illustration 6 is very similar to illustration #5. In this room’s furniture arrangement two 3-cushion sofas are placed next to each other to form the seating group. Illustration 7 has the sofa placed on an angle by the window and french doors, there is a floor lamp to its left. Two upholstered chairs, with another floor lamp between them, counterbalance the sofa. Illustration 8 shows kind of a flip of illustration #7, but now an extra upholstered chair and end table with lamp has been added for extra seating and illumination. Illustration 9 is similar and a flip of illustration #2. Three upholstered chairs and a floor lamp, counterbalance the sofa and floor lamp, placed opposite them. Illustration 10 is a bit like illustration #5, but now you have just one upholstered chair on each side flanking the sofa, and two upholstered chairs, with floor lamp counterbalancing it. Illustration 11 shows two 3-cushion sofas facing each other. The large wooden elements that counterbalance the fireplace have been eliminated, and two upholstered chairs and a floor lamp have been added on that wall. With the two chairs placed on that wall, a grouping of pictures must be hung above the chairs to make visual weight, which would counterbalance the fireplace. In a way, the two chairs have replacing the chest/credenza with things hung over them. Counterbalancing the two chairs on the right side of the room are two chairs with floor lamp between them on the left. Not shown in the illustration, but another floor lamp could be placed to the left of the french door, by the window, for added illumination. Illustration 12 shows the 3-cushion sofa, one more time, with its back facing the breakfast bar. It is counterbalanced by the two chairs and a floor lamp opposite it. By the window, on the left side of the room, are two more chairs and another floor lamp. Those two chairs face a chest/credenza with TV above it, or armoire with TV inside, or entertainment center cabinet with TV; it is also flanked by a side chair (SC). 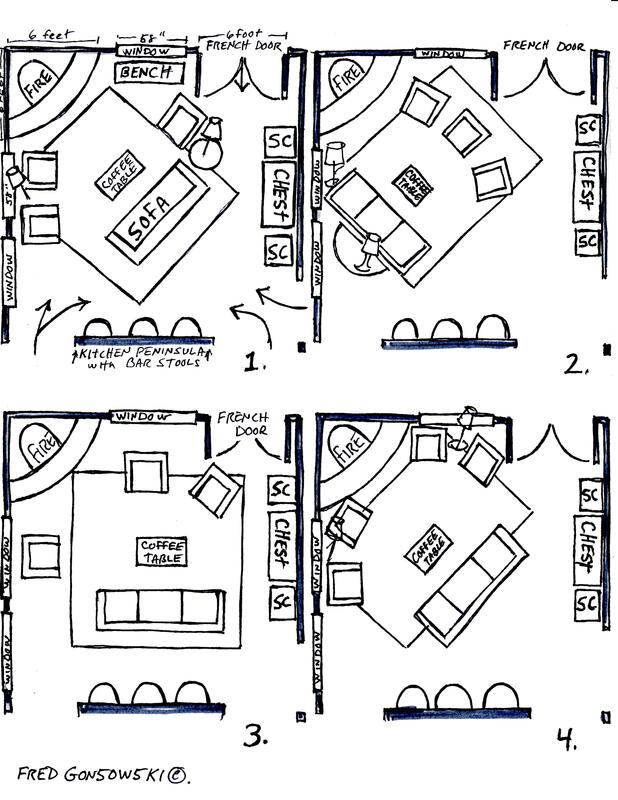 So there you have it, twelve different ways to arrange furniture in a 20 foot square room. I have one final suggestion…Before purchasing any kind of furniture for your home, be it wooden, metal or upholstered, get its exact measurements for width, depth and height. Go home and tape together newspapers to make templates/cutouts showing the size of the furniture that you are thinking of purchasing and place those cutouts on the floor where you think you want it to be. In one second you will know if what you are thinking of buying is too big for the space, or just right. When buying upholstered furniture pick something with a good-sized seat area, but don’t get something that is too over padded or has arms that extend out like wings. Pieces of furniture that are too large take up too much space, and limit the amount of furniture you can place in the room. If you live in a building with an elevator make sure the delivery men can get it into an elevator, up stairs and make turns around corners. If in doubt, ask the store where you are thinking of purchasing the furniture to come and take a look before you purchase the piece. If the furniture store says they can get what you want into any house or apartment, have them sign a piece of paper (the purchase order) saying if they can’t get what you ordered into your home, they will take it back and you will get a full refund. I had them do that when, years ago, I purchased a large four-poster bed. To all the readers of this article I hope there was something in it that inspired you and please look at the Companion Posts. Thank you, a fabulous post! Fred! No words. I need to find my words. Thank you! I think that #2, #7 & #8 would look amazing in your home! If I’m not mistaken, this was written about your house? How lucky to have such a talented person provide so many fantastically detailed options! I’ve been reading and studying, and I’m only on first illustration. This is beyond helpful Fred, and I’m so appreciative. Lovepaso, happy you like the piece, hopefully it will inspire many people. Love this post, it’s so full of constructive info that I feel like I’ve completed a course in Interior Decorating! I’m definitely going to save it for future reference. Thank you for taking the time to share your knowledge with all of us Fred! By the way and regarding your previous post, I must have seen your Big Eyed People works in Vermont, or Westchester and Connecticut or Cooperstown, as I have traveled to these areas, so thank you for jogging my memory, I was wracking my brain trying to remember where I might have seen them. What a relief! Hi there Margaret, glad you liked the post, I’ve looked at many “supposedly” interior decorating sites, and to me they just cover fluff, as I think the writers really don’t know the principles of design, which I learned going to art school. Here. I’m trying to go over the basics with my readers, so they will be hopefully inspired and be able to make changes tweaks in their own homes that will make a better environment to look at and live in. I just came across this post and this is incredible! I have nearly the same dilemma as the owner of this room and have been looking online, in magazines and books for help for months! I have slightly more of a problem in that my french doors are centered on the wall instead of the far corner. This is the first post I have read of yours so I will be reading many more! If you are able to help with this dilemma please do let me know! Do you take pictures and measurements to give advice? I have a living room rectangle in shape with corner fireplace, three large openings, and two entrances and I cannot find any arrangement that works well and makes sense in the house. Hi there Summer, could you take measure of the four sides of the wall (north, south, east and west)? Measure each wall starting on the left corner, working to the right side of that wall. Write down the distance from the corner of the room to the first window, the length of that window, the amount of inches of space after that window to any door in the room, its width, and the amount of inches from the door (it here is one on that wall) to the right corner of the room. Do that for each wall, and make sure you label the wall for north, south, east and west, Also get the measurements for the fireplace and the space around it. Your problem could turn into an interesting post. I will be looking for your followup, if you want me to come up with possibilities. Thank You! I would love for you to help. I rearrange weekly trying to come up with a good flow. The room is: North wall – from left corner 31 3/4″ to a 45″ opening (leads to kitchen), 13’10” to corner. East wall – from left corner 29″ to a 6 ft opening (leads to entry), 7’11” to corner. South wall – from left corner 6′ 3 1/2″to a 4′ opening (leads to hallway), 60″ to corner fireplace. Corner fireplace is 65″. West wall – from fireplace 10 1/2″ to a 70″wide window, 18 1/2″ to 32″ door (to back yard), 10″ to corner. Hi there Summer, thanks for your return comment with measurements. In the next few days I will make a diagram using your measured on paper and try to come up with possibilities. One more thing, what kind of furniture do you already have (how many sofas, chairs, end tables, chest, etc), and what are their dimensions for width and depth? I could come up with my own opinion for things needed in the room, but knowing what you have will help me to work in what you already have. I have sofa – 40”d x 100”l, loveseat – 40”d x 72”l, an ottoman – 36” x 36”, and two end tables – 24” x 24”. I would like to add a chair or two if possible. I’m open to suggestions on what to add as well. Wooooooow!! Just Need to say I learned more reading your blogs than all the House Beautiful, Living Mag, HGTV,and Houzz info I’ve studied over the past 40 years Combined!!!! Going from a 3000 sq.ft in CT to a 1200 sq.foot cottage in PA has left me challenged to say the least. an Antique Spiral Staircase on the opposite side from the fireplace which goes into my new sleeping loft ( I’ve Always wanted a spiral stair and a hidden away spot just for me and the kitties), so I believe you would say I need to “balance” the fireplace and the spiral and then work from there..But since the Spiral, albeit the smallest diameter possible at 3’6, encroaches into the walk way toward the front door, I’m just not sure if the designs will work..
Hi there Joy, first of all I want you to look at a recent post of mine titled Shopping the Upscale stores in New Preston, Ct. You don’t have to read the whole thing, but read the part starting at my little tour of Privet House. The part I want you to examine most is the dark upstairs rooms, with their light accents. You might be inspired by my explanation of the spaces. Next read my article titled Paint a room a Dark Color, then add Light Accents, that one will help you even more. If you have not looked at it yet, read Interior Decorating as All about Equal Balance, if you can understand that, which I know you will grasp quickly, you will understand what decorating is all about. Pick (Use) Four colors when Decorating a Room, is another must to implement if you want as cohesive looking space. Equal balance is not just about using furniture, it is also about making groupings of things( pictures, plates, or other decorative items) that the finished arrangement is about the same size as the thing you want to counterbalance. Look at the Categories on the right side of your screen, I hope you are looking at a computer, not a phone, as that might be impossible to do. Click on the title for the the posts about hanging pictures, those posts talk about balance also. All the different interior decorating topics that I’ve written about are under those titles. Interior Decorating Principles, I think has everything under one name. At the end of any single page, click on more and other pages of topics that I’ve written on will be seen. I’m a lover of North-west Connecticut and have gone there my times. Back in the day when I did art shows, I did shows in Greenwich, Mystic, Middletown, Old Saybrook, etc to name a few. Thanks for your comment about learning from my site, the purpose of FGGH is to inspire the readers, so they can hopefully have a house that is warm and comfortable and is a happy reflection of them. Hi there Joy, first of all if you have a black iron spiral staircase in you living room, I would suggest having some other black iron things, or black colored things in the room to just keep the black moving around your space. Secondly, I never say there is really a right or wrong when it comes to how to decorate. If a lot of oil paintings and a lot of antiques “Smile at You” then that is just fine. A person deserves to view beauty, and beauty is in the eye of the beholder, and if what you have makes you happy every day, then everything is OK. Right now there is a real disconnect in the decorating world. If you go to model show houses, you will probably see a lot of things in gray and paired down a bit. If you look at some of the popular decorating magazines and some of the more know decorating “coffee table books” you will see a lot of things antique, but they mix in some transitional or modern things to cut the “museum” look and give the illusion of things collected for many years or generations, versus from one period. There is sometimes a lot of layering of decorations also. I do think a lot of antiques can be updated with more modern colors or textured fabrics or you could paint walls more happy colors or mix antiques with more modern looking wallpapers (grass cloths for example), or sprinkle some modern things in-between the antiques. If you are interesting in doing something like that, I would say collect some modern knickknacks in the colors of the antique things so they go together for at least color. If you have a minute read my posts about hanging art works, there might be something in those posts that will help you to make more interesting arrangements of things. What is your sister’s name and where in Millbrook does she show, on occasion I go that way and will look up her things. What fun, you are kind of assembling my book for me. Sort the articles by category, and in a way you will have a decorating guide. Put them in a binder and as I write more things, you can interfile them with what you have already assembled. Look at the article I wrote about Bunny Williams Studio at her Falls Village Ct, Estate, notice how she slip-covered some of the furniture to give antique pieces a more modern facelift. Thank you so much Fred. Her name is Susan Dorazio….but most of her work has now been removed by her husband- long story.. Ill keep working on my living room.. I have So much furniture for this tiny 1400 s.f.home ( which I LOVE as I wanted to downsize) that I have the “classy” problem of having too much of a good thing! lol. My barn is already getting a loft full of antique chairs instead of hay! One problem that I have not been able to locate in All your amazing articles is regarding addressing the Open kitchen-dining-living room dilemma. I recently took down a wall between the kitchen and living room ( which I love!) BUT arranging my various vignettes while still maintaining a nice walking and eyeball “flow” has been a true challenge. I also have Four Focal points- A Fireplace- an elaborate Spiral Staircase (across from Fireplace on opposite wall) and a Large 10 foot window overlooking my front pasture which is across from my Kitchen and Island.. Its hard-no Impossible- to select one as the True focal point–how should i address that? I’m trying to get ideas for arranging from all your articles–but it almost seems I need to select one or two only as focal points..? FYI: YOU, my man, have been giving me more ideas and insight based on true design rules which I was missing and That has been Tremendously helpful. THANK YOU! This room is very similar to my family room. The difference is that where your room has two windows, I have a sliding glass door, where your french doors are, I have a solid wall. I only have one entrance into the room which includes a step up into the kitchen (same side of the room as your kitchen peninsula). Trying to find a layout that incorporates the fireplace and a TV has been challenging. Thank you for your wealth of information. I am so happy I found your site. Hi love your ideas. 16 x28 open room with fireplace iat end of long side of one full wall no widow other two ends of room have large 3 window and other end two separated long windows. It was once two rooms opened up. Other long wall has a 1/2 4 ft divider with square columns to ceiling the rest open. Need furniture arrange to ideas. Hi there Elaine, have you looked at my post titled Arranging Furniture in a 12 foot wide by 24 foot long living room, you could possibly use those illustrations as a starting point for your room.